SAN DIEGO (AP) — Former America’s Cup champion Rome Kirby has been named skipper and helmsman of the United States’ team in SailGP, the new global league that will be sailed in foiling 50-foot catamarans beginning next year. Kirby, 29, of Newport, Rhode Island, won the America’s Cup with Oracle Team USA in 2013 and has also sailed in the Volvo Ocean Race. He is the son of Jerry Kirby, also a former America’s Cup champion and Volvo Ocean Race veteran. The other members of the U.S. crew, announced Wednesday in New York are wing trimmer Riley Gibbs, 22, of Long Beach, California; flight controller Hans Henken, 26, of Coronado, California; grinder Mac Agnese, 24, of Fort Lauderdale, Florida; and grinder Dan Morris, 30, of Newport, Rhode Island. Morris has won a World Match Racing Tour title. Agnese, Gibbs and former youth world champion Henken are all bidding to represent the United States at the 2020 Olympics. SailGP, launched last week, was founded by American software billionaire Larry Ellison and New Zealander Russell Coutts, a five-time America’s Cup winner. 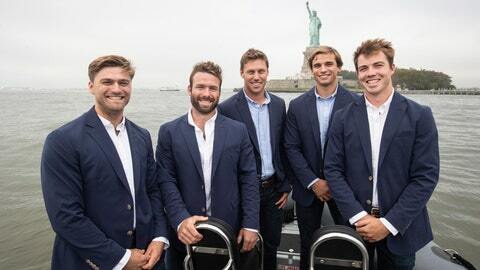 They began working on the concept of the annual global league after Oracle Team USA was routed by Emirates Team New Zealand in the 2017 America’s Cup. Kirby was a reserve with Oracle Team USA in that regatta. SailGP will have five regattas next year, starting in Sydney, Australia, in mid-February. There will be stops on San Francisco Bay on May 4-5 and on the lower Hudson River in New York on June 21-22. There will be five regattas in 2019, with teams from six countries. Plans call for the league to eventually expand to 10 teams from 10 countries, with 10 regattas. SailGP will initially be underwritten by Ellison, with plans calling for it to move to a franchise ownership model. Coutts envisions it becoming commercially sustainable. The next America’s Cup will be in 2021 in Auckland, New Zealand. SailGP will be contested in F50s, a redesigned and reengineered version of the catamarans used in the 2017 America’s Cup.